Does the Height of the Dividers Differ Per Use? Does the height of the dividers vary by their intended use? 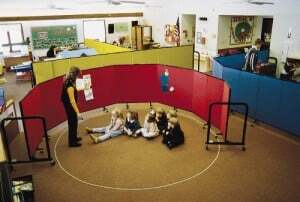 For Sunday school and adult classes, six-foot dividers or taller are the most popular. It is easy to make additional rooms for temporary (or semi-permanent) use as needed within the church or school. Tackable, sound-absorbing dividers easily roll into place, unfold accordion style, and can be set up in any configuration as needed. When Should Churches Think About Divvying up Space?